FPGA Central is a vendor neutral place to find everything about FPGAs, CPLDs, EDA Tools for FPGAs. It is created from ground to provide a central place for FPGA Vendors & Users to share experiences and information about FPGA Design, Development, Verification, Validation, Process, Tools and Products so as to make more informed and better decisions. 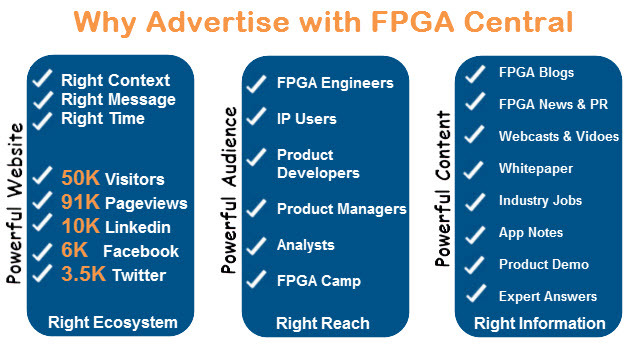 Get connected to powerful network of FPGA and related technologies Designers, Engineers, Engineering Managers worldwide by advertising with us through online publicity, direct marketing or research services at an affordable price. Contact us at [email protected] to get learn more about our advertisement options.